Normally, the first year of life can be and is one of the happiest of the life span. The dependency of young babies makes them appealing to children as well as to adults. Most children like to play with them, while adults not only want to cuddle and love them but are happy to tolerate their crying and the other disruptions their care brings into their lives. By contrast, for almost all babies the second year of life is far less happy than the first. There are many reasons for this. Not all babies, it is important to recognize, have reason to be unhappy as babyhood draws to a close, nor are babies who have one or more reasons for unhappiness always unhappy. There are times when they are happy, just as there are times when they are not. Which condition will dominate depends on how many reasons the baby has for being unhappy and how frequently the causes for unhappiness occur. Babies who are neglected or abused by their parents or other caretakers have more reason to be unhappy than those whose parents and caretakers are only occasionally so annoyed by their behaviour that they treat them in a punitive way. 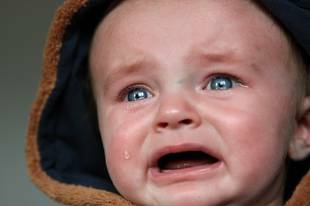 Generally, most babies have more reason to be unhappy during the second year of life than during the first. Babies who are in poor health, either temporarily or chronically, do not feel up to par and, as a result, tend to be fretful and irritable. Being happy under such conditions is difficult if not impossible. Teething causes periodic discomfort, if not actual pain. When in pain or when experiencing discomforts, babies tend to be irritable, fretful, and negativistic. This predisposes them to be unhappy. With increased control over their bodies, most babies resent assistance from others and interference when they are trying to be independent. They show their resentment by being balky or by having temper tantrums. As waking time increases, babies want more attention from others. When parents or other caretakers cannot give this attention, babies become angry and fretful. This leads to punitive treatment from parents or other caretakers which babies interpret to mean that they are unloved and unwanted. By the baby’s second year, it is not uncommon for parents to become somewhat disenchanted with their parental roles. This is especially true of parents who glamorized the parental role before assuming it. Their disenchantment is expressed in lack of warmth in their relationship with the baby – a change in attitude which babies easily sense and resent. After babies have had their first birthdays, many parents believe that the time has come to initiate discipline. Initial attempts are usually limited to slaps, spankings, harsh words, and angry facial expressions. After a year of no discipline, it is not surprising that babies interpret this changed parental behaviour to mean that they are no longer loved and no longer wanted in the home. When parental discipline is characterized by harsh corporal punishment, babies have every reason to feel unloved and unwanted. Even worse, they live in constant dread of abuse from the people who take care of them, Under such conditions, even brief periods of happiness are infrequent. Many children who at first considered the new babies in their homes “adorable dolls,” come to regard them as pests, especially when they are expected to help take care of them, or when the babies take over their possessions, often damaging them. Babies quickly sense how their siblings feel, and this makes them unhappy when they are with them. In large families, where the care of babies is often in the hands of an older female sibling, babies have reason to experience frequent periods of unhappiness because they are aware of how their sisters feel about them and how they resent having to play the role of a surrogate parent.